3TP BLUE BLOSSUM is a large framed cow that was shown when she was younger. BLOSSUM loves her scratches and will eat from your hand! Every once in awhile their is a cow that owns you, instead of the other way around. BLOSSUM is that cow! We love her and when it is her time to cross the Rainbow Bridge, it will be at the LONG M RANCH! She calves every 10.5 months, even at her age. We love her! 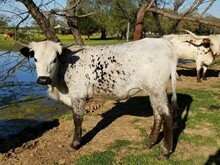 3TP BLUE BLOSSUM is a big bodied cow with old time genetics. 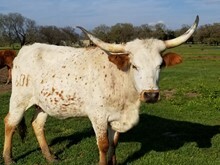 She has beautiful Texas twist horns. 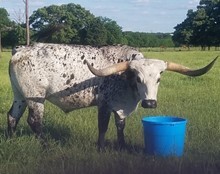 Big Blue Roan. She has a baby every 10.5 months. She eats out of your hand and loves scratches.